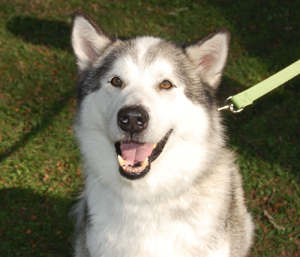 Mobi is a handsome and hefty husky/malamute that had been found as a stray and became a guest at our local shelter. This big guy weighed in at 110 pounds! When we met Mobi, he greeted us so sweetly and was so depressed at the shelter. We knew he needed some help from some new friends and we were happy to find him foster space in our rescue. An immediate vet check and bloodwork confirmed our suspicions. Mobi is hypothyroid, a condition that causes increased weight. He has been taking his prescribed medication, exercising and watching what he eats (like a good boy)! We are very happy to say that Mobi is a healthier weight and a much healthier pup! Mobi is sweet, calm and slow but strong. He is happy to see you and wags his tail a lot. He will climb up and down on the sofa. Mobi enjoys the company of the other pups in his foster home and can now engage more actively in play.